Posted: Fri Mar 28, 2014 11:55 am Post subject: Transporting a top bar nuc. 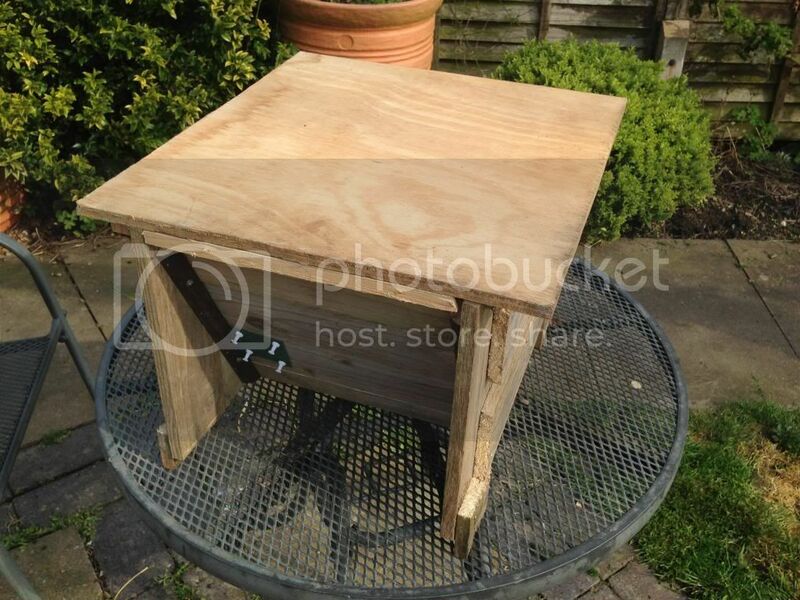 I have arranged to buy my first colony of bees from a member of this forum in the form of a top bar nuc and will be picking them up on Sunday. It will involve a good hour and a bit drive though and since I'm totally new to beekeeping I was wondering if I could ask for some advice? 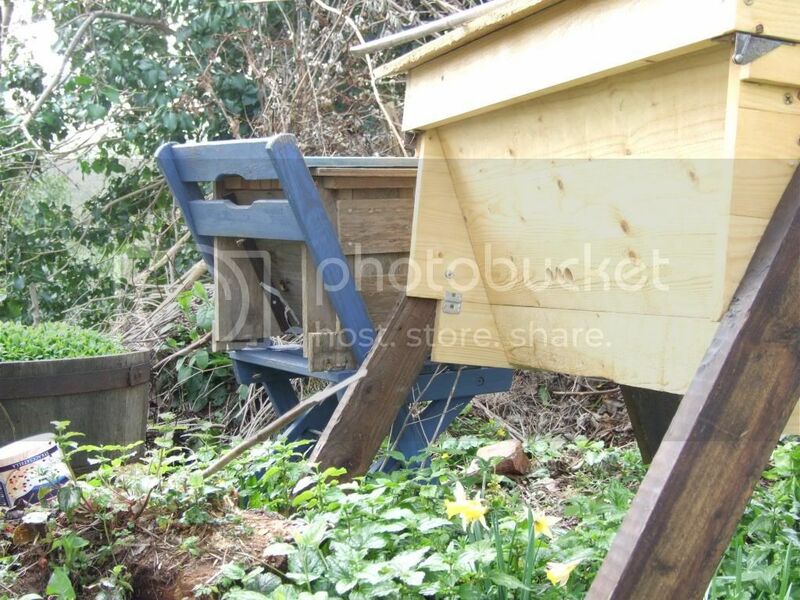 I have made a wooden top bar nuc box on the same dimension as my and the sellers hive to transport them in. I have made it as bee tight as possible but was wondering weather I need ventilation? At the moment it only has one 22mm entrance that I have covered with plastic mesh. It has a solid floor but that could be replaced with mesh easily. The seller has advised to align the combs with the direction of travel to reduce the stress on them, strap it up with webbing or duct tape and possibly rap the box with a sheet to catch any escapees. Any comments on my plan so far as well as more tips or advice will be greatly appreciated. Definitely needs some ventilation. You say its easy to replace the floor with mesh, that's what I'd do in addition to the screen over the entrance. Also lift the nuc up on blocks so the air can get in underneath. I move hives between yards on a regular basis. Aligning the combs to the direction of travel seems to make sense but in reality they should be aligned 90 degrees to the direction of travel. The reason is that you have more control moving forward and back compared to side to side. The rocking is exaggerated due to the wheel base being narrower side to side over the distance front to back. On smooth asphalt roads aligning the combs either way should work just fine. The ventilation you have should be fine on a cool day for that time frame. Garret did you have any comb collapse during transport? I will be moving my 6 colonies in TBH in April from Sweden to Denmark, a 3 hour jouney. They will be in a trailer. Ah thanks for the replies. I have replaced the floor with mesh just in case, I was umming and ahhing about it anyway. That's interesting Garret, I hadn't thought of that. I suppose its more of a problem on country roads. I'm hoping since the colony is only just coming out of winter the combs will not be too heavy so there will be less strain on them and not so lightly to be damaged by moving. Over several years of moving hives only a few of the most freshly built combs that were heavy with nectar. My suggestion is to remove the most delicate combs and transport in a separate hive void of bees to introduce back into the original hive once at the new location. Transporting with only brood combs and allowing the bees access of the full hive volume is best. For a 3 hour journey (haven't transported that far/long) I would give water somehow. Maybe in the form of a sponge in a dish of some sort. 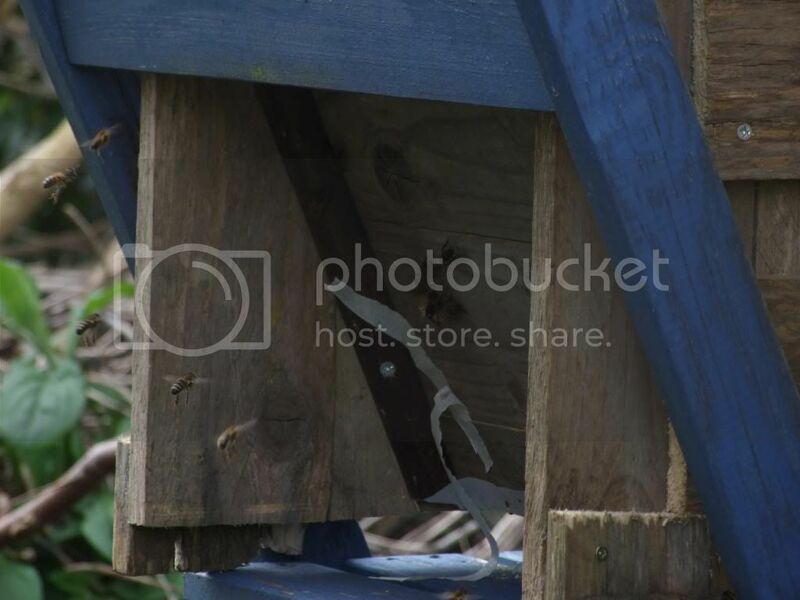 I would also replace three or four of the top bars at the back of the hive with screen for ventilation and to avoid drafts. Transporting at night is great as the bees travel quietly and are fine with mild bumps and rocking. I should mention that the combs in my hive are larger than most of the hive designs out there. From memory I think yours are similar to mine so I think your move will go fine. Yes I will move at night when all bees return home and heat isnt an issue. My trailer will be covered so no drafts and the entrance will not face the dirrection of travel. Combs in my hives are 40cm x 30cm x 20cm. All comb is last years so Im guessing they are fairly stable. I will be driving mostly on the highway. I will not have any other ventilation than mesh over a 30mm entrance. Im a bit nervous to place sponges in my hive not knowing whats in those sponges. Most stuff is made in China these days ... What about using live moss? So just for the record here's the finished nuc box. 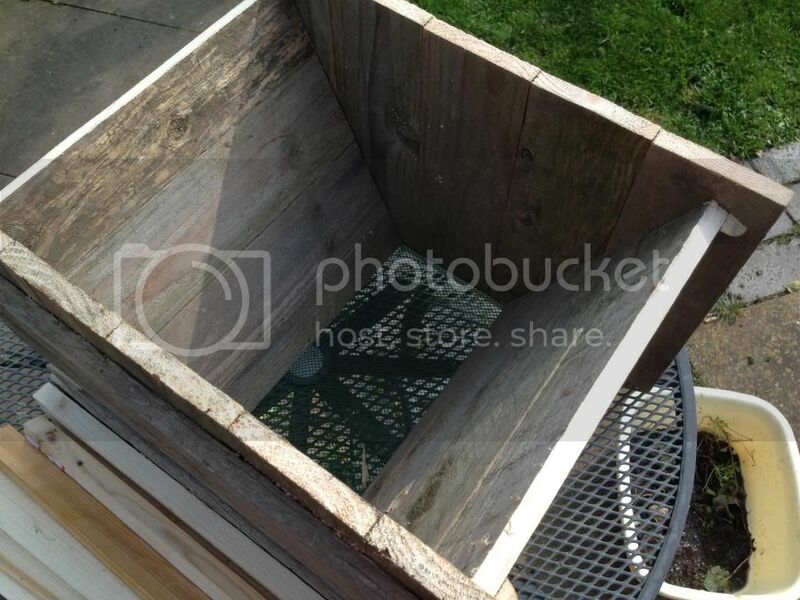 Entirely made from old pallet wood and bits and pieces from a next door neighbors shed clear out. I made it a couple of bars bigger than it needs to be so its a bit more versatile for later use and now with a mesh floor made from an off cut of plastic greenhouse shading. What about using live moss? Great idea! Anything that will hold a small amount of water so it doesn't splash around. At night and having access to the whole volume of the hive they should be just fine for the 3 hours. ........ They will be in a trailer. My trailer tends to be quite "bouncy" unless well loaded. If yours is the same I'd add extra weight in the bottom to help stabilize. To take some of the bounce out of the trailer, you could lower the air pressure down to the lower end of psi that the tire limits specify. I picked up the bees yesterday and it all went really well. Had a couple of escapees on the way back, the one thing I forgot was a sheet, but they settled down as soon as it got dark. They got home as happily as you could expect and in one piece. They are flying quite happily (if a little confused) today despite it being overcast and a little damp. The guy I bought them off (ChristianMaass on here) was really helpful and full of info. They look really strong and healthy. Here's a couple of pics of them in the nuc next to the hive they will be going into in a couple of days.